जिसे युवा मामले एवं खेल मंत्रालय के अधीनस्थ भारतीय खेल प्राधिकरण ने विकसित किया है। इस एप का उपयोग अन्य कार्यों के अलावा देश में विभिन्न खेल स्थलों, उनकी उपलब्धता, खेल के नियमों और किसी भी व्यक्ति की फिटनेस का पता लगाने में किया जा सकता है। Khelo India App helps you to get information about various games (HOW TO PLAY - ‘LEARN’) , available sporting facilities (WHERE TO PLAY – ‘PLAY’) and fitness assessment of your children (‘GET FIT’). 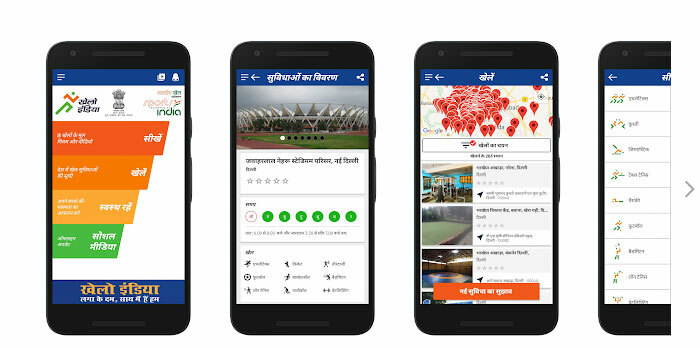 This application is developed by Sports Authority of India under Khelo India Scheme of Ministry of Youth Affairs and Sports, Government of India. Schools can now download the School version of the app i.e"Khelo India (Schools) App " for fitness assessment of their school students.